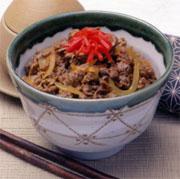 The donburi is such a popular dish in Japan that there are restaurants devoted to it. This is one of the most common varieties. Cut the onion into slices (5mm). Cut the beef into bite size pieces (3cm). Heat the oil in a pan and fry the onion and the beef. Add [A], bring it to the boil, and then lower the heat and cook for 10 minutes. Place the rice in a bowl, and pour over the cooked topping. Garnish with red pickled ginger.